Does Glucosamine Work for Knee Pain? Have you been wondering to yourself, does glucosamine work? You may finally have an answer thanks to a recent study. If you’re still confused about all the conflicting messages about joint pain supplements and wondering, ‘Does glucosamine work?’ you may finally have an answer. Since the large GAIT trial in 2008, we’ve suspected that glucosamine works for people with at least moderate pain due to knee osteoarthritis, especially when it’s combined with chondroitin. I wrote about the combination last year here, summarizing the inconsistent research results to-date. Now, we finally have even more proof that these supplements work. A large new trial has found that glucosamine plus chondroitin sulfate works as well as celecoxib (Celebrex) for providing clinically significant pain relief for people with moderate-to-severe knee pain. For Whom Does Glucosamine Work Best? Many people with knee pain due to osteoarthritis have considered trying, have already tried, or are currently taking glucosamine supplements. If your osteoarthritis pain is milder, glucosamine may not provide any noticeable relief, even if you’re combining with chondroitin. But if you have moderate-to-severe pain and you haven’t yet tried the full recommended dose of this combination for at least a six-month period, you may want to reconsider giving this safe, natural therapy a try given the results of the most recent study. Researchers from the University of Maryland School of Medicine, France, Germany, Poland, and Spain conducted a double-blind study of 606 patients with knee osteoarthritis and recently published the exciting results in the Annals of the Rheumatic Diseases. They included only those with moderate-to-severe pain (defined as a Western Ontario and McMaster Universities Arthritis Index [WOMAC] pain score of 301 or higher on a scale from 0 to 500). Previous studies indicate glucosamine and chondroitin work best for this population. Patients received either chondroitin sulfate 400 mg plus glucosamine hydrochloride 500 mg (made by Bioibérica) three times a day or celecoxib 200 mg every day for 6 months. The combination of glucosamine hydrochloride and chondroitin sulfate decreased pain by 50 percent, the same decrease seen in patients randomly assigned to receive celecoxib. In addition to significant reductions in pain, both groups had similarly significant improvements in stiffness (46.9 percent reduction with the combination vs 49.2 percent with celecoxib), and function (45.5 percent vs 46.4 percent, respectively). 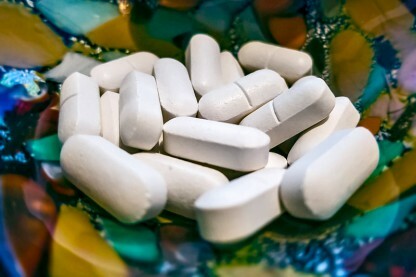 Are NSAIDs Worth the Cost and Risks When There’s a Safer Alternative? Glucosamine/chondroitin is a much safer alternative to nonsteroidal anti-inflammatory drugs (NSAIDs) like celecoxib, especially if you have a cardiovascular or gastrointestinal condition. While glucosamine and chondroitin have good safety profiles and tolerability, NSAIDs unnecessarily kill thousands of Americans a year. Celecoxib is not only costly, but it increases the risk of both minor symptoms, like dyspepsia, and major side effects, like heart attacks, heart failure, and life-threatening ulcers. If you have moderate-to-severe knee arthritis pain, you no longer have to keep wondering, “Does glucosamine work?” Take 400 mg chondroitin sulfate and 500 mg glucosamine hydrochloride (or sulfate) three times a day, consistently, for at least six months, and track your pain. You will very likely find that this simple, natural treatment provides safe, significant relief. Try the combination for osteoarthritis in other joints, too, since there’s good evidence that the supplements relieve the pain in the hips, hands, low back, and other common sites. In addition, you may want to consider supplementing with other nutrients and/or herbs proven to treat osteoarthritis pain. You can read about my top five favorite joint supplements here and about the latest research on MSM here. Have you tried glucosamine and chondroitin for osteoarthritis pain? Tell us how it worked in the comments section below. Originally published in 2015, this post has been updated. J Pain Palliat Care Pharmacother. 2008;22(1):39-43. Ann Rheum Dis. Published online January 14, 2015. Cochrane Database Syst Rev. 2015 Jan 28;1:CD005614. anti inflammatory, anti inflammatory drugs, arthritis, arthritis pain, cardiovascular, chondroitin, does glucosamine, does glucosamine work, gastrointestinal, heart attacks, heart failure, joint pain, joint pain supplements, joint supplements, knee arthritis, knee osteoarthritis, knee pain, msm, natural treatment, nsaids, nutrients, osteoarthritis, osteoarthritis pain, pain, pain relief, severe knee pain, severe pain, side effects, supplements, ulcers. In 2016, at age 61, I attempted to hike the Appalachian Trail. My knees paid the price. After stiffness and pain for the past 6 months, I tried Glucosamine and Chondroitin in a combination. I was VERY skeptical and my father said it would be a waste of time and money per his arthritis doctor. I feel like I’m writing to say I was abducted by aliens, HOWEVER, I genuinely notice a difference in my pain and mobility! I understand the placebo effect, and I believed I would not see any difference. Well, you cannot convince me now to stop taking the supplement. I am really wanting to try the trail again in 2018, so I am hopeful this is not a psychological fake out because my mind wants to be back on the trail. I believe this combination supplement actually is working for me. I thought you might be interested in this article on https://universityhealthnews.com: Does Glucosamine Work for Knee Pain?